Breville has been producing centrifugal juice extractors that are affordable and popular with most people who enter into a juicing lifestyle. There are many models that are already selling well but with the introduction of their new masticating slow juicer, it will soon be another best seller due to Breville’s reputation with quality juicers. I think it is a smart move by Breville to realize that the trend is moving towards slow juicers, and to invest in a vertical juicer model like the BJS600XL. 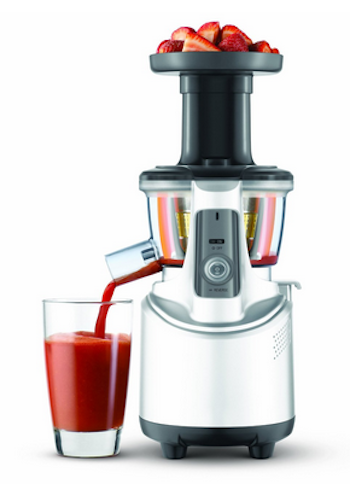 Breville fondly calls this juicer the Juice Fountain Crush. It is a vertical single gear juicer that crushes and squeezes with its GE Ultem auger (image on right) which is 8x hardier than that of the first generation masticating juicers. This method of extraction maximizes the amount of nutrients extracted, preserves enzymes and prevents rapid oxidation of juices. Masticating juicers are best for juicing most fruits, even small fruits like berries, fine grasses like wheatgrass or barley grass, and excels at juicing leafy greens. It is timely as consumers are now looking for alternatives to what centrifugal juicers cannot do. The Juice Fountain Crush crushes and juices slowly, producing nutritious, delicious, smooth, and concentrated juice, expelling very dry pulp. The little extra you spend on the initial investment, will save you much more in the short run from buying less fruits and vegetables. All parts have to be properly locked in place in order for the juicer to start. It has an anti-overload system that automatically stops the machine when it gets overloaded. The chute is deep enough that errant fingers will not be able to reach into the juicing chamber. It has a reverse direction control to bring up produce in case they get “jammed” inside. The Juice Fountain Crush operates very quietly with a low droning sound, making it a joy to use in the early morning without waking up the household. makes life easier as less time will be spent cutting up the produce into smaller sizes. In between making different kinds of juice, simply pour water through the chute while the motor is running to clean out the juicing chamber. This is helpful for retaining the taste and color of the next glass of juice. The “wiper” attachment (image on right) spins when the juicer is in operation, to remove any pulp that sticks out of the strainer. This allows juices to continuously flow smoothly. The silicon wiper blade comes in an amber color to reduce unsightly pigmentation stain which usually comes from carrots or beets. This wiper also makes the strainer easier to clean afterwards. The trend is now moving towards the upright/vertical design, giving it a smaller footprint compared to horizontal masticating juicers. Whether horizontal or upright, aesthetically, it’s a matter of personal preference. 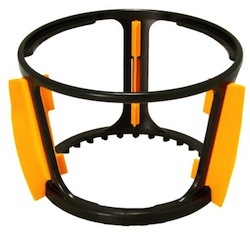 Function-wise, a horizontal juicer can do more, like mincing, grinding and making pasta. Most people buy a juicer mainly for juice extraction, therefore, if you want the additional functions you may like to look at horizontal juicers. The Juice Fountain Crush comes with a juice collecting jug and a pulp bin. The juice spout is located on the left hand side of the juicer body, and the pulp expeller is 90 degree angled to the front. 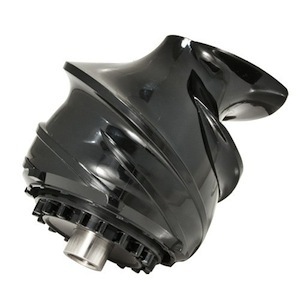 There is an indentation in the juicer body that serves as the “handle” for the motor, making it easily moveable and space saving, instead of a protruding handle. When feeding fruits and vegetables into this juicer, remember that because it is a “vertical”, the produce will self-feed by gravity. Most of the time there is no need to use the food pusher because when you do, you’ll tend to be more impatient and push through the produce. This may cause the overload system to trigger more frequently. Let the machine run at its own pace. 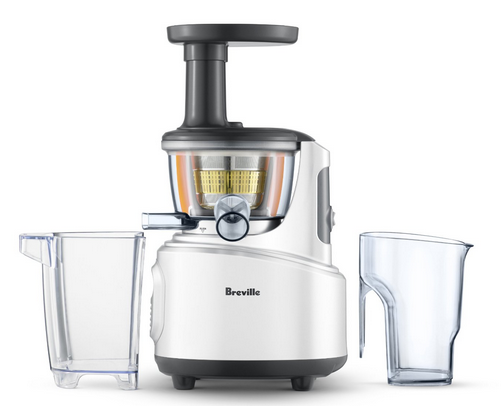 Breville introduces this model as one that produces juices with “smooth pulpy texture”. Like all other vertical slow juicers, there tends to be more pulp than horizontal juicers. It is an advantage if you like “pulpy”. If not, neither is it an issue, simply use an external strainer (not provided) to sieve out the pulp. One other advantage with slow juicers, which I need to mention is that you get “stable juice”. The extracted juice doesn’t get separated like juices extracted using centrifugal juicers. This is because the enzymes and nutrients are still intact. Oxidation also occurs less slowly. To store, make your juice as cold as possible and store them away in air-tight containers in the fridge away from air and light. It will keep for up to 24 hours when kept cold, although I will still always recommend drinking them as fresh as possible. If taking the juice to work, fill it up cold, and up to the brim, in a thermos flask to keep the cold in. I have never been a fan of Breville’s centrifugal juicers, although I know they are very popular with most beginners. However, when I heard that they introduced a masticating slow juicer, I was interested.